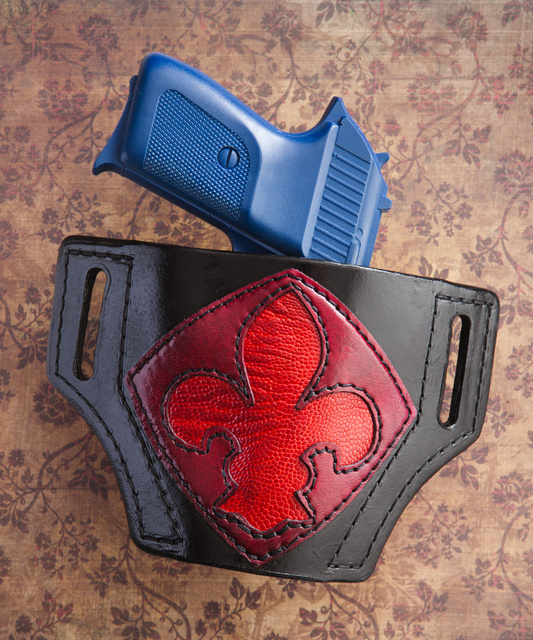 This entry was posted in holster, pistol and tagged 380ACP, bersa, blue gun, Dragon Leather, fluer-de-lis, leather. Bookmark the permalink. Very nice leatherwork. Is it a trainer pistol? If not that is a sweet blue. If the holster is fitted for a Bersa, why is it currently housing a P230? Because I’m away on business, and couldn’t ship a Bersa handgun to Oleg to take the pictures, I sent the holster with a Bluegun of the SIG 230, which is, dimensiaonally, the same size/shape as the Bersa Thunder .380….both of which take 98% or their design cues from the Walther PPK/S. I’d hate to have to keep it concealed, even if I am from Texas, not New Orleans. Nice work. Its a liability issue…Rings Blueguns are by far the BEST mock-up / model / trainer out there, that a simple spray of flat black paint is all you need to make it look real. I would be willing to bet that the move by Glock to restrict Blueguns from the sales was most likely the result of a lawsuit somewhere, where Glock is named in a suit that involves a “lifelike” model (be it a Bluegun, and AirSoft, etc…) and its easier for Glock to simply put the kabosh on the use of the design of their guns in such fashion than it is to actually defend themselves against spurious lawsuits. While there is are laws in place that shield manufacturers of guns from liability if their guns are used in crimes (and rightfully so, since they can’t control the Ctions of the people weilding the tools…) there are no laws to protect gun manufacturers from civil/ criminal liability if a fake model of solid plastic that LOOKS like theirs is used in a crime. A creative-thinking lawyer can build a case on that premise, and with a sympathetic jury seated, he stands a good chance at recovering damages from Glock. easier to just stop the likeness of their product from entering the marketplace, and cheaper in the long run.